Scientific Consilience has been founded in 2010 as partnership company (Partnerschaftsgesellschaft) by Dr. Jan Fuhrmann, Dr. Dirk Neumann, and Dr. Alexander Rurainski. Scientific Consilience has been one of the first companies in Germany in the legal form of a partnership company with members that do not have the same profession. Although legally allowed this fact led to some peculiarities during the registration process. As one of the consequences the correct company name according to German law has become Scientific Consilience Dr. Fuhrmann, Dr. Neumann, Dr. Rurainski - Partnerschaft, Bioinformatiker, Chemiker, Informatiker most commonly not fitting into official forms with character limits. The founders met a few years earlier at the Center for Bioinformatics, Saarland University, Germany (CBI). At that time Dr. Neumann worked as an independent leader of a junior research group, Dr. Fuhrmann and Dr. Rurainski were finishing their doctoral studies. The idea to spin-off an independent company for the free economy addressing special recurring tasks was a result of two basic observations during the cooperation with several other scientific research groups in the fields of biology, chemistry, and pharmacy: First, there were increasing requests for computational solutions to facilitate some research in general. Second, all these groups had needs to reduce lab costs in particular. Scientific Consilience's business model found general approval. As a consequence Scientific Consilience was financially supported by the German Federal Ministry of Economics and Technology and the European Social Fund at the time of commencement (project funding reference number: 03 EG SSL 003). Furthermore, Scientific Consilience achieved active support by KWT (Kontaktstelle für Wissens- und Technologietransfer) and WuT (Wissens- und Technologietransfer GmbH), Saarland University, Germany. In 2011 Dr. Fuhrmann left Scientific Consilience by mutual agreement for personal reasons. At the same time Scientific Consilience changed its orientation and focused on statistical analyses for biological data as well as on simulating and predicting transdermal absorption. Both areas had been fields of research before and were made ready for the market. At the end of 2011 Scientific Consilience has been among the 10 best of 174 participants of the business plan competition medical sector (Medizinwirtschaft, Startbahn MedEcon Ruhr). The accordant business plan has been certified by the 3CERT GmbH. These milestones opened the doors for the actual small spin-off company to multinational customers. 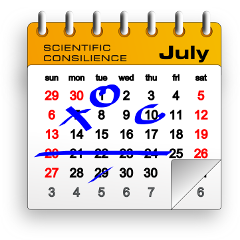 In 2014 Scientific Consilience has changed its legal form to limited liability company (GmbH) because of several side effects of the recent form. Especially the official name from now on, Scientific Consilience GmbH, is shorter and has proven itself to be more memorable than the previous one with more than 100 characters.